Moving house is an expensive affair in Hong Kong, and Christmas is an expensive affair all around the world, so my bank account has taken a bit of a beating lately. But nothing will stop me from treating myself to baking goods and equipment! Yesterday I managed to resist buying a fancy £30 cake tin, but still splashed out on some food colouring, fondant icing and cake cases. They’re not indulgences, they are necessities! 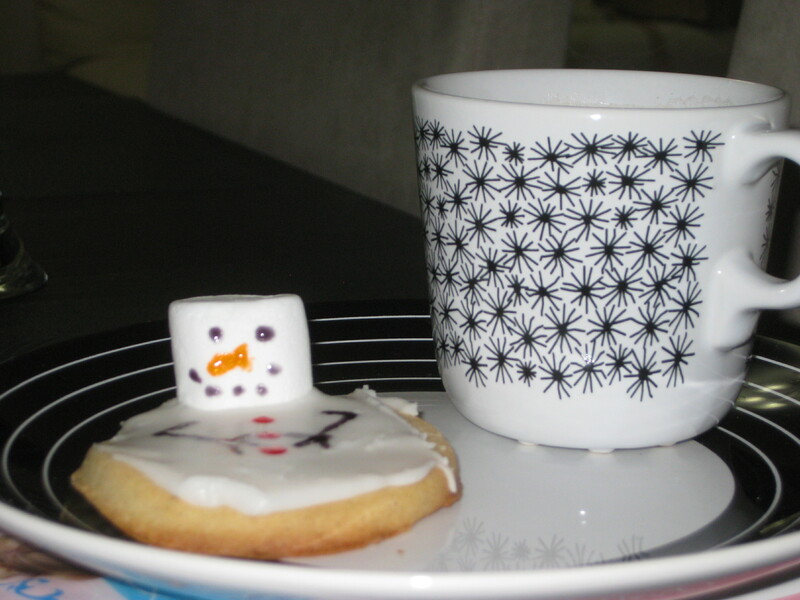 Another purchase earlier this year was a few Wilton icing pens and sparkle gels, with these festive biscuits in mind. You only need a few colours, and look at the effect they have – definitely a worthwhile investment! 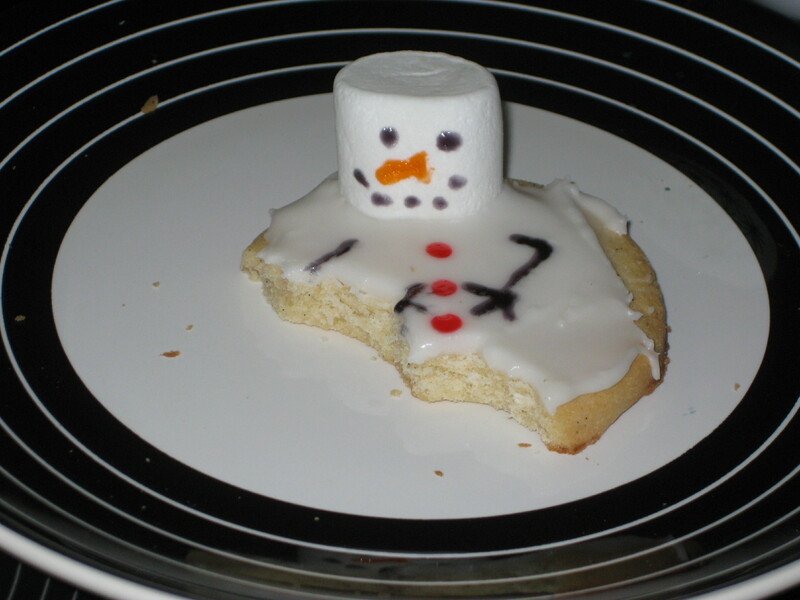 These melting snowmen biscuits were all over blogs last year, and I’ve been dying to make my own. They could have been better – a slightly squishier marshmallow, a bit of icing running over the edge to add to the melting illusion – but nevertheless I was pretty happy with their cuteness. You can of course vary the biscuit you use, and something with a bit of spice would be appropriate for the season, but these vanilla ones are pretty tasty too. 1. Make the dough as per the vanilla biscuits recipe. Roll it out and stamp out quite large circles – I used ramekins. They don’t have to be very even, to give them a more bedraggled look. Bake as stated in the recipe. 2. When the biscuits have cooled, make the icing, again as per the original recipe but leaving it white. 3. Prepare the marshmallows. If you have a microwave, blast them for 10-20 seconds so they become a little squishy to get that melting look. (I didn’t do this with mine, due to lack of microwave.) 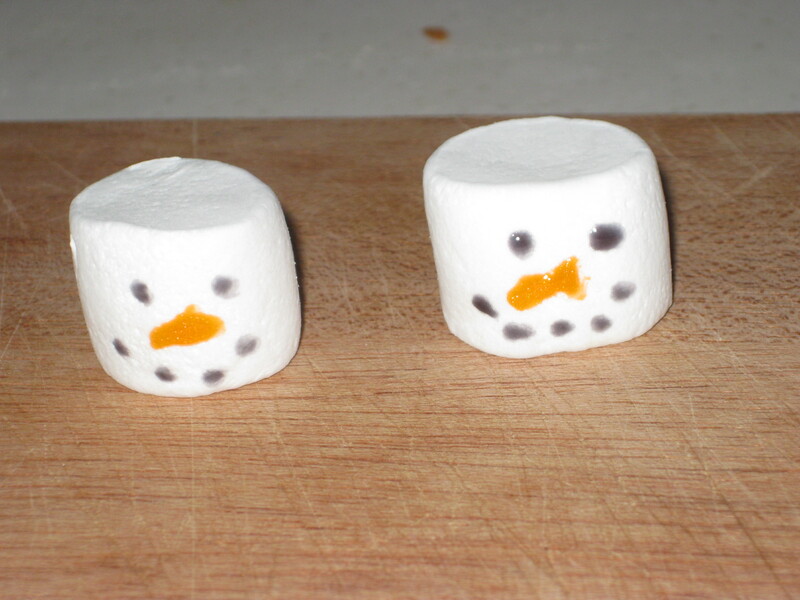 Use your icing pens to draw on eyes, a nose and a mouth for each snowman face. 4. Use a palette knife or spoon to spread the white icing over each biscuit – I wish I’d let it run over the sides to really get that melting look. 5. While the icing is still wet, press on a marshmallow head. 6. 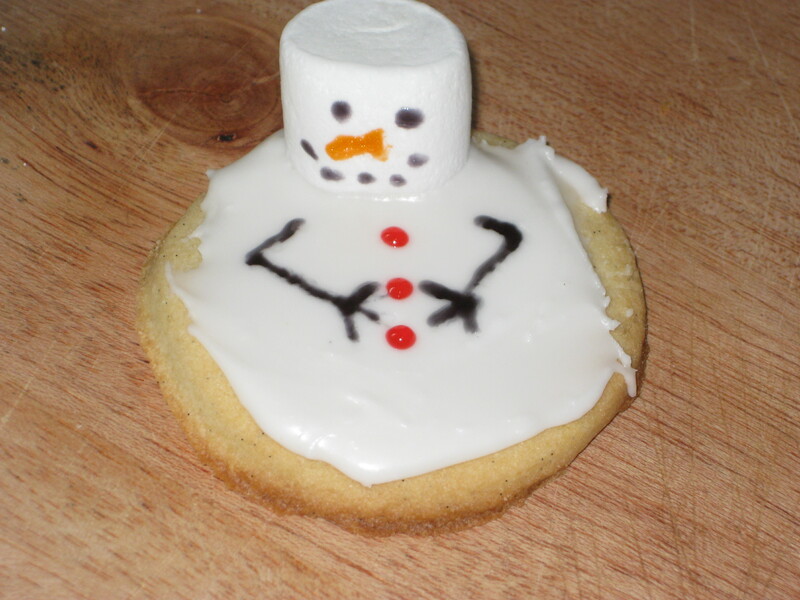 When the white icing has set, draw on some arms and buttons for your snowman. 7. 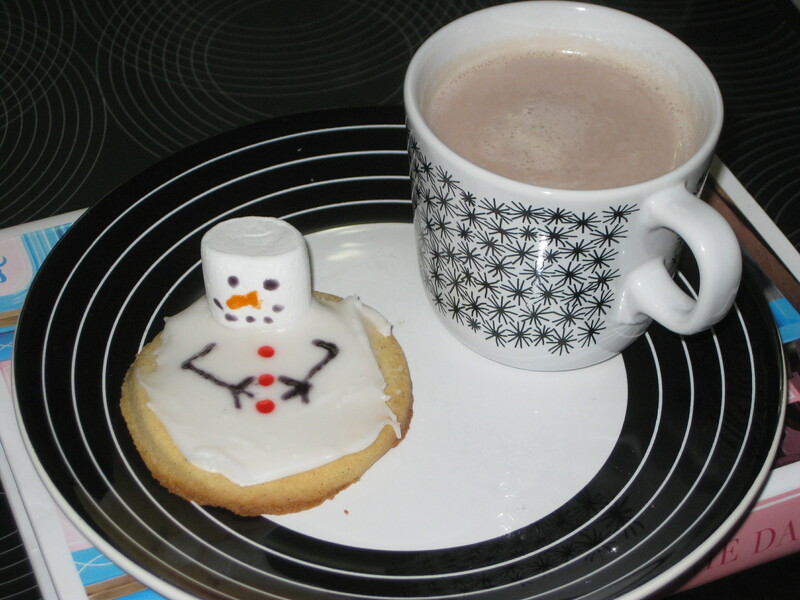 Best enjoyed with a steaming mug of hot chocolate and some Christmas carols! 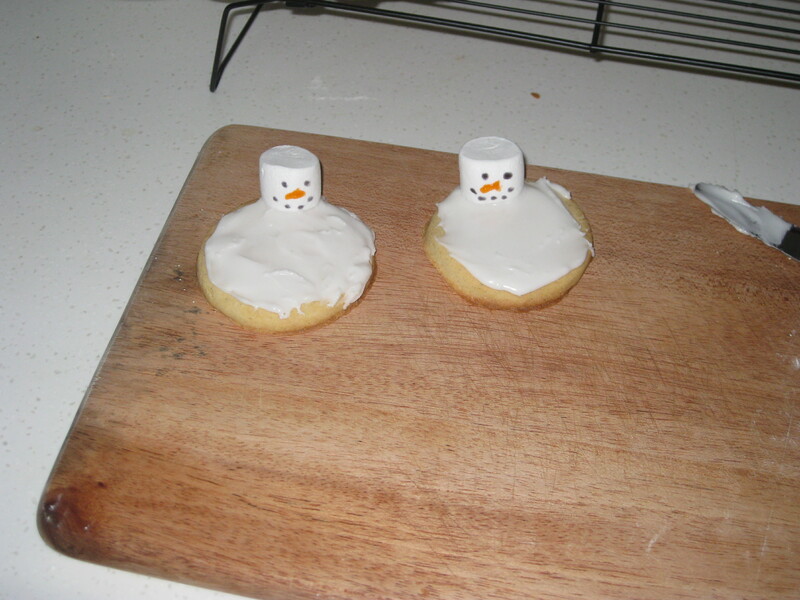 This entry was posted in Vegetarian Recipes and tagged Christmas, Christmas baking, Christmas cookies, melting snowmen. Bookmark the permalink. I have to try those!! They are deceptively easy to make and get a very positive response!